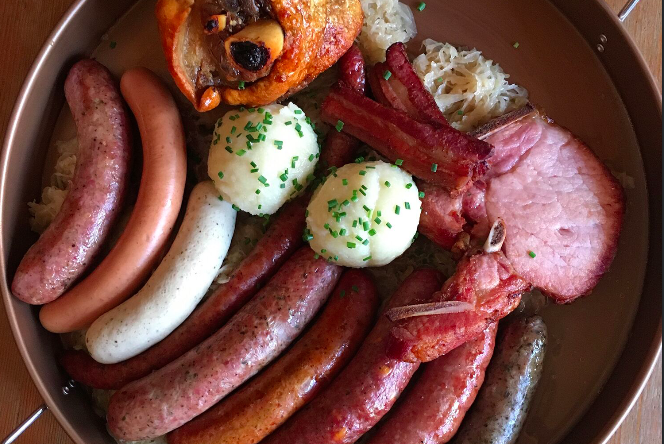 Expanded menu at Brauhaus Schmitz includes house-made kielbasa, käsewurst and wiener. Just in time for summer, Philadelphia's foremost bierhall is introducing a new menu that will emphasize the restaurant's German roots and schnaps. The South Street establishment, opened in 2009 by German-born owner Doug Hager, described the new menu as an "energetic return" to German classics. Most of the menu changes revolve around an expanded sausage program, house-made kielbasa, käsewurst and wiener. Here's a rundown of the new menu items curated by chef Jeremy Nolen. Located at 718 South St., Brauhaus Schmitz has more than 30 German beers on draft and more than 50 in bottle.